Talk about warehouse sublevel? SAP Business One can fulfill your needs more than you think when it comes to warehousing strategy. As promised before, now we share another useful tips with SAP Business One if you want to use shelving system or another warehouse operational strategy that needs smaller addressable unit of space in a warehouse where your inventory stocks are stored. 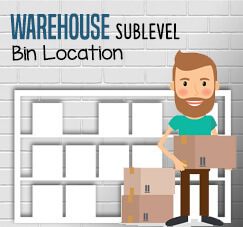 Bin Location on SAP Business One equipped with 4 warehouse sublevels. You can decide for yourself how much detail the warehouse setting that you want, if you just want to maintain 1 sublevel, it’s okay, you can do that. For example, we have one warehouse that already equipped with Bin Location settings, named Warehouse 01. In case you didn’t know how to activate a bin location, please click here. Is it clear to imagine it? From bigger unit to smaller unit. 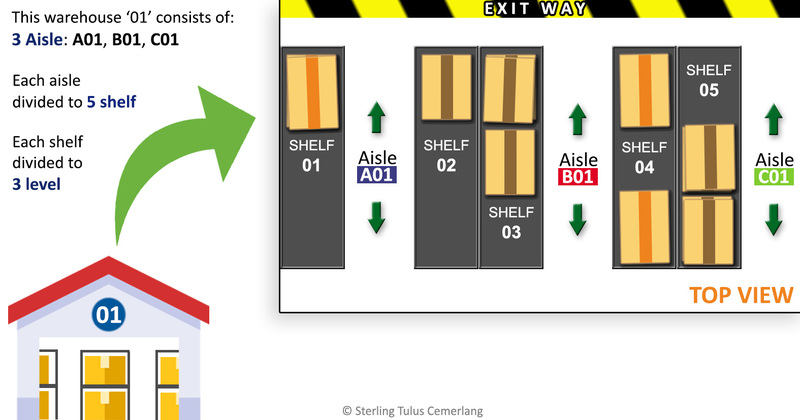 First, you must set a sublevel: aisle, shelf, and level. 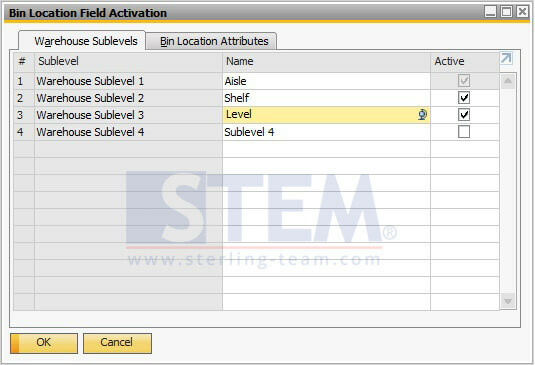 Go to Bin Location Field Activation menu, rename the sublevel, tick as ‘Active’, then click Update. Next, after you define all the sublevels, move to “Warehouse Sublevel Codes” menu. You can find 3 sublevels that you already created. 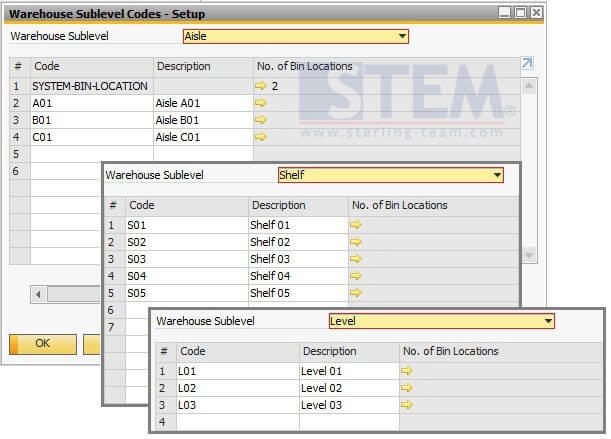 Input the code and description for each unit on your warehouse sublevel. 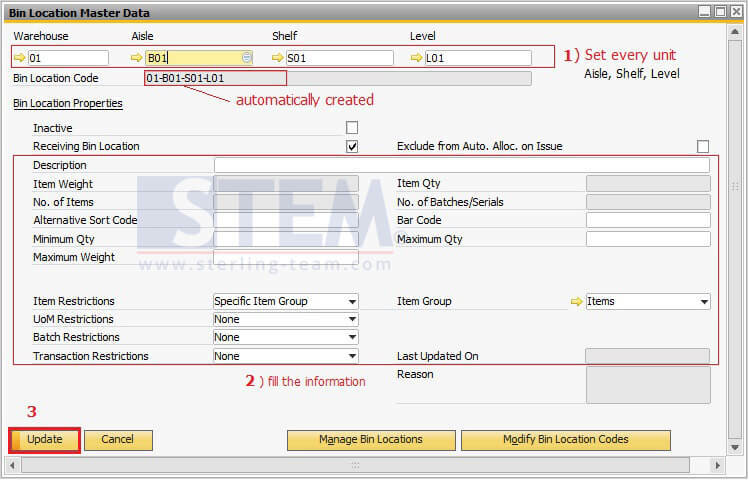 Go to “Bin Location Master Data” menu. 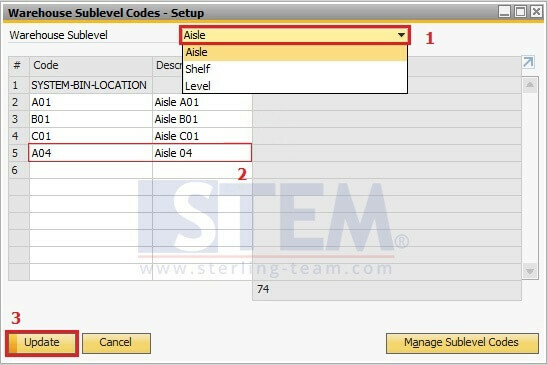 Click on the radio button for choose a warehouse, aisle, shelf, and level. You must set it one by one for each unit. Fill another useful information base on your own preferences. In case you want to change a separator for each sublevel, you can change it on Warehouse menu, choose Bin Locations tab, there’s a field “Bin Loc. Code Separator“, as default set is ‘–‘, just change it when you need to. Don’t forget to set your Default Bin Location for each Warehouse, that setting will be located below “Bin. Loc. Code Separator” on Warehouse menu. Now, let’s take a look on Inventory Transaction. How’s these settings affected to Good Receipt transaction. This warehouse already set with default system bin location, so SAP will be choose it as your default allocation. If you need use multiple bin location, click on Quantity column, choose Bin Location Allocation option for modify or add new bin location to your items on good receipt’s row. If you want to see Inventory Posting List based on this Good Receipt document, open your document, right click on the empty spot on header, choose option Inventory Posting List. It shows 2 lines, split base on bin location code.